Delaney starred in both track and football in college, and rushed for 3047 yards and 31 touchdowns, including 299 yards on 28 carries in a game against Nicholls State. He was chosen by the Chiefs in the second round of the 1981 NFL draft with the hope that his speed would make him an ideal situational back. Chiefs went 9-7 to finish third in the AFC West while leading the AFC in rushing (2633 yards). Injuries marred Delaney’s play in 1982, a strike-shortened season, and he appeared in eight of the nine games. He ran the ball for 380 yards on 95 carries (4.0 avg.) and caught just 11 passes. His career was tragically cut short during the offseason when he drowned while attempting to save three children in a pond. 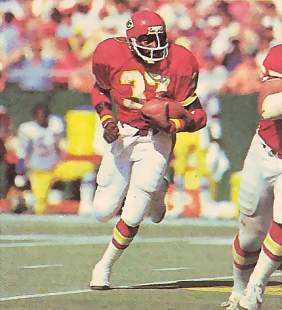 Chiefs players wore a patch in his honor during the 1983 season and his name was later added to the team’s Ring of Honor at Arrowhead Stadium.